Pet obesity is a growing problem, currently affecting an estimated 58 percent of cats and 54 percent of dogs in the U.S. Experts say being overweight can have negative consequences on a pet’s overall health and quality of life. To that end, the U.S. Food and Drug Administration (FDA) is urging pet owners to take steps to identify and combat obesity in their own pets. Excess weight can seriously harm your pet’s health and even lead to a shorter life span, said Carmela Stamper, a veterinarian in the Center for Veterinary Medicine (CVM) at the FDA. “The diseases we see in our overweight pets are strikingly similar to those seen in overweight people,” Stamper said, naming as examples diabetes mellitus (also known as Type 2 Diabetes), osteoarthritis, high blood pressure, heart and respiratory disease, and kidney disease. “We want our pets to live happy lives, but we also want them to live long ones,” she said. Pets are considered “obese” if their weight exceeds their ideal body weight by 20 percent or more. Your pet’s ideal weight will vary depending on its breed, age, body type, and metabolism, according to the FDA. Labs and beagles, for example, tend to be more prone to obesity than other breeds. Long, low dogs -- such as dachshunds and basset hounds -- are also more prone to packing on extra pounds. “Neutering can slow down a dog or cat’s metabolism, and so can aging, especially if the animal gets less exercise than when younger,” the agency said. Your veterinarian can tell you what your pet’s ideal weight is, as well as give you an idea of how much food your pet should be eating on a day-to-day basis. A non-defined waist. Look at your pet from above to see if they have a definitive waist. “If not, and her back is broad and flat like a footstool, she is likely overweight,” Stamper said. Sagging stomach. Animals at a healthy weight should have a tapered or “tucked” abdomen. Can’t feel their ribs. Check to see if you can feel your pet’s ribs by running your hands along their sides. You shouldn’t have to push too hard to feel them, nor should your pet’s ribs be too prominent. 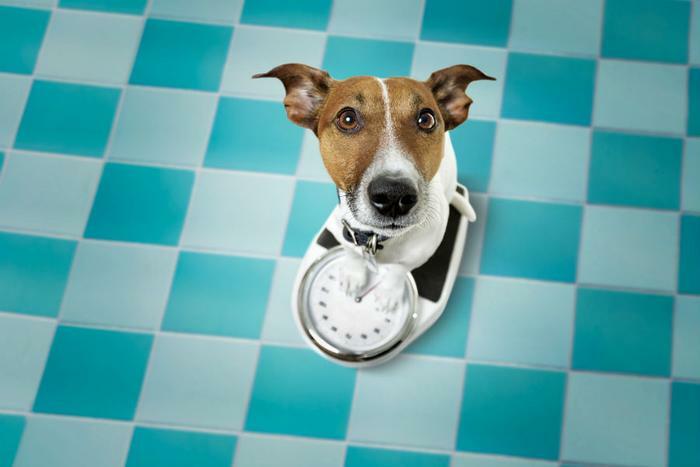 If your pet does have a few pounds to shed, Dr. Kirk Breuninger, Veterinary Research Associate, Banfield Pet Hospital, suggests taking small steps to help them get down to their ideal weight. “Just as with people, weight management is unique to the individual pet,” Breuninger told ConsumerAffairs. Your vet can help you determine a healthy weight for your pet, as well as help you make a game plan for how to get there. Additionally, he recommends cutting down on “people food,” which can quickly add up to extra pounds on your pet. While helping your pet achieve and maintain their ideal weight is in their best interest, you don’t have to cut out treats altogether. For most animals, an occasional treat is fine. However, be sure to limit treats to no more than 10 percent of your pet’s daily calories. The key is take an “everything in moderation” approach and talk to your vet if you’re concerned about your pet’s weight, Stamper said.